Note: This is an advanced review for Black Library. The Red Duke is not released in stores until November 2011. The Red Duke is the latest novel in the Warhammer Heroes range, produced by Black Library, and, as the series title suggests, it focuses on Heroes of the Warhammer world, making this particular series a must for any fantasy fans. We’ve had Wulfrik, Sigvald and Ludwig Schwarzhelm take starring roles in this popular series, and now it’s the Red Duke’s turn to take the stage. Unfortunately, I don’t know as much about the Warhammer world as I do the Warhammer 40,000 universe, so I probably would have delved into the back-story of the Red Duke here. But, seeing as I’m not, I’m just going to have to give you a brief overview of the plot. Before the Red Duke was a vampire, he was a knight, and not just any night. A noble, honourable and chivalrous knight of the realm, and he remained that way until he was betrayed, back-stabbed in battle… but, rather than die there, he was reborn – as a bloodthirsty, vicious undead monster, who undertook a long crusade of slaughter and ruin before he was eventually defeated. And not only defeated, but entombed for all time, never to rise again. Until the witch Jacquetta seizes her chance to free the Red Duke, and a new campaign of the undead begins for the second time. The Red Duke seems unstoppable in his madness, but then… perhaps his madness can be used against him. Author of Brunner the Bounty Hunter, and the popular Thanquol and Boneripper Trilogy, CL Werner is perhaps, as mentioned earlier, my favourite WHFB author. Having read the entire set Warhammer Heroes novels bar Sword of Justice by Chris Wraight, The Red Duke continues to prove why this series of standalone books is the top-tier Warhammer Fantasy series out there, even when including Gotrek and Felix, admittedly which I’ve only read the first Omnibus of. Nonetheless, you probably want to know what makes The Red Duke great. Well, Werner manages to get the personality of the Red Duke himself just right, and not only that – but find a way to combine the past and the present of him in a way so that it doesn’t really bog down the storyline, although, saying that – I did find myself skipping a few of the flashbacks when I was in an enjoyable scene in the ‘present’. Other than that though, the pacing is done well, with the action scenes being brutal and bloodthirsty. Turning away from the Red Duke now, the Bretonnians provide an interesting break from the mad vampire, as their characters help let us know what’s at stake should the Red Duke win, and give us a ‘hero’ to fight against the anti-hero that is the Red Duke himself. Knights, brave sons, great swordsmen and counts are all featured in the pages of The Red Duke, and we really get to understand more about Bretonnian history in this book, and what honour means to these noble knights. The description is pretty enthralling as well, and we really get to take a peek into the surroundings of the Old World, as much as we get to know the characters that Werner has put across for us. We get to ‘know’ everybody, from the cowardly necromancer Renar, to the Red Duke himself, and in particular, his motives, as to why he wants to pillage and conquer Bretonnia. Revenge is perhaps, the most important theme in The Red Duke, with two characters in this novel spurred by it, one being the Duke himself, and the other I won’t mention the name of due to spoilers. Action is enjoyable in this novel. A cavalry charge against the lines of the undead, and even the way the undead themselves fight, proves that Werner certainly does know what he’s doing. Should you buy this book? Yes, if you enjoy the Bretonnians and their lore, vampires (the real kind), and possibly Warhammer Fantasy fans in general. 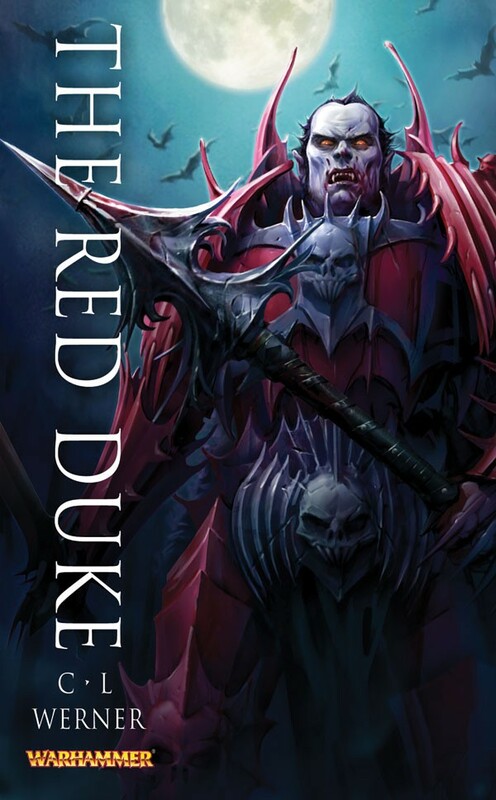 I don’t know about if you’re a non-Warhammer fan, but The Red Duke is a good read, and should be high on your list of WHF books to get if you are one. More C.L. Werner: Grey Seer, Temple of the Serpent, Thanquol’s Doom, Mathias Thulmann: Witch Hunter, Brunner the Bounty Hunter.